The brethren of Lodge of Equity and Appleton No 1384 and guests met at Widnes Masonic Hall to witness the installation of Ian John Lynch as WM. Ian had been previously installed twice as WM of Pendlebury Lodge No 8177. Ian Edge (left) congratulates Ian Lynch. The dispensation was read by the secretary Chris Douglas and the notice convening the meeting was taken and read. WM Ian Edge started the evening’s proceedings by welcoming the visiting brethren to the meeting. He then opened the lodge in due form and conducted the initial business of the lodge. The director of ceremonies Brian Rafferty, announced that Barry Jameson was without and seeks admission. Barry processed into the lodge accompanied by grand officers John Hutton, Alan Locke and Derek Williams, Widnes Group Chairman Neil Pedder and acting Provincial grand officer David Rigby. Ian warmly welcomed Barry on behalf of the lodge and the brethren present, hoping he would have a very enjoyable evening. The lodge was then opened in the second degree when the WM requested Norman Speed to occupy the senior warden’s chair, Bob Winch to occupy the junior warden’s chair and for Alan Gerrard to act as inner guard for the ceremony of installation. At this point in the proceedings Ian Edge presented Barry with cheques in favour of the following: WLFC £400, Eccleshome £50, Another Chance to Care (WM’s chosen charity) £350 and the MCF 2021 Festival £500, plus other donations for the year totalling £741, making a grand total for the year of £2,041 in charitable donations. A none charitable donation of £500 was made to Widnes Masonic Hall development fund. Barry thanked the brethren on behalf of the recipients for their generosity. 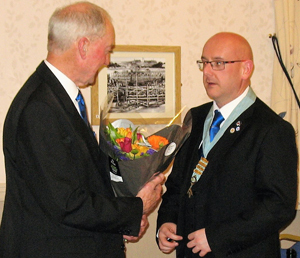 Ian then thanked the brethren of the lodge for their support during his year of office. The master elect Ian Lynch, was presented to the lodge by Derek Williams, after which the installing master Ian Edge, proceeded to install Ian into the chair of King Solomon in a confident and sincere manner. Ian Lynch (standing) proposes a toast to Ian Edge. The brethren of the lodge were admitted in the three degrees and the DC Brian proclaimed Ian Lynch from the east, west and south in due form, with the working tools being presented by Chris Douglas (third degree), David Penny (second degree) and Brian Rafferty (first degree). WM Ian Lynch then appointed and invested his officers for the ensuing year, following which John Hutton gave the address to the WM. The address to the wardens was given by Trevor Price and the address to the brethren of the lodge by Barry Jameson. The DC Brian announced to the WM the conclusion of the installation ceremony, at which point Barry addressed the brethren by bringing congratulations from the Provincial Grand Master Tony Harrison, wishing Ian and all the brethren the very best of health, hoping that they have a very happy and enjoyable Masonic year. Barry congratulated the installing master Ian Edge for the excellent and sincere manner in which he had installed Ian into the chair. Barry then proceeded to congratulate all the brethren who had taken part in the ceremony. The lodge was then closed in due form with the brethren retiring to the Alan Locke Suite to enjoy an excellent meal and a few celebratory drinks. 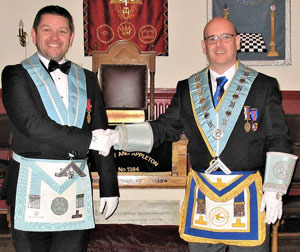 Responding to the proposal to his health by the SW David Penny, Barry stated that it was a pleasant change to have an evening of Craft Masonry away from his Royal Arch duties. He then brought his own congratulations to Ian Lynch and especially the installing master Ian Edge and all those who took part in a first-class ceremony. Barry went on to say that we are a year into the MCF 2021 Festival and stated that there are several ways of supporting the Festival, either through a one-off or monthly donation by individuals, enabling them to wear the steward’s jewel, or for lodges and chapters to make donations, ultimately becoming a patron or vice patron of the Festival. As Second Grand Principal in the Royal Arch, Barry went on to remind those brethren who are not yet members, of the rich and colourful order that marks the next step in Freemasonry. As part of the awareness campaign, the strapline is ‘enjoyable, vibrant, stimulating – the complete degree’. This can be seen on the literature and pop up posters displayed in Masonic halls. Ian (right) presenting a bouquet to Barry. Concluding, he said that by joining a chapter you will increase your Masonic acquaintances beyond the membership of your own lodge, which in turn can lead to an increase in your Masonic experience and knowledge. WM Ian Lynch responded to the toast to his health, proposed by IPM Ian Edge, by saying that it was an honour to serve as WM in this lodge and he will do his utmost to work hard and be an ambassador for the good of the lodge. Ian then made a number of personal acknowledgements; to Derek Williams who had proposed him into the lodge and supported him throughout his rolls within the lodge and group structure; to John Hutton who had been there throughout his time in Masonry and for undertaking both the address to the master, which was really special and for the impromptu performance of the master’s song; to Barry, whom he is frequently out with in his role as acting Provincial Grand Steward in the Royal Arch, so it was particularly nice to have him representing the PrGM and supporting him at his installation and to Neil Pedder, who has been a constant support and help. In closing Ian thanked all those members who took office and as instructed by the PrGM he will enjoy his year as master of the Lodge of Equity and Appleton. The toast to the IPM Ian Edge was proposed by WM Ian Lynch who said that Ian had been a fantastic ambassador for the lodge by visiting many lodges throughout the group and also throughout the country, fitting them around his busy work schedule. He has also introduced the lodge’s most recent candidate Elliot Dennett, who he hopes will follow in his footsteps as a Mason. Ian has also worked hard for the lodge as social secretary and has been a keen supporter of local charities and is an enthusiastic Mason who will be installed as first principal in the Royal Arch in two months’ time. At the festive board a raffle was held which raised £36. The tyler’s toast then brought a most enjoyable and excellent evening to an end. John Hutton (right) toasts Ian with the master’s song.